The goal is to learn to solder or improve your skills in soldering. This is a FREE class (donations to CMARC always accepted) but kits are limited, so we need an accurate head count. Students will be enrolled on a first come basis. Kits are limited to CMARC club members in good standing or anyone attending the Technician Licensing Class or Electronics Class. 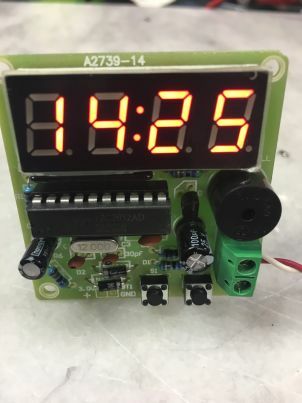 This project can be used as a common clock, count up or down device or a incremental counter. It can be used to trigger another device after a predetermined time or count events with an external input like items on a conveyor belt, people entering a facility, or cars driving into a parking lot. It will take about 2 hours to build this kit, depending on your skills. Please contact me Gordy Smith KE8JKS to reserve your spot and learn more details about the class. If you have a soldering station, please bring it. If not, the club has a few new ones you can use. Safety glasses are required but not supplied. Safety glasses can be picked up for a couple of dollars at places like Harbor Freight, Lowe’s, or Menards. Come meet people, learn new things and most importantly be a part of your club.